According to the Division of Sleep Medicine at the Harvard Medical School, the short-term productivity gains from skipping sleep to work are quickly washed away by the detrimental effects of sleep deprivation on your mood, ability to focus and access to higher-level brain functions for days to come. The negative effects of sleep deprivation are so great that people who are drunk outperform those lacking sleep. We've always known that sleep is good for your brain, but new research from the University of Rochester provides the first direct evidence for why your brain cells need you to sleep (and sleep the right way—more on that later). The study found that when you sleep, your brain removes toxic proteins from its neurons that are by-products of neural activity when you're awake. Unfortunately, your brain can remove them adequately only while you're asleep. So when you don't get enough sleep, the toxic proteins remain in your brain cells, wreaking havoc by impairing your ability to think—something no amount of caffeine can fix. 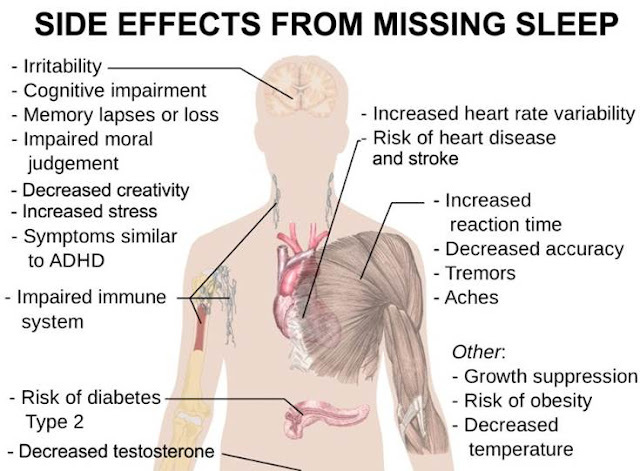 Sleep deprivation is linked to a variety of serious health problems, including heart attack, stroke, type 2 diabetes and obesity. It stresses you out because your body overproduces the stress hormone cortisol when it's sleep deprived. While excess cortisol has a host of negative health effects that come from the havoc it wreaks on your immune system, it also makes you look older, because cortisol breaks down skin collagen, the protein that keeps skin smooth and elastic. In men specifically, not sleeping enough reduces testosterone levels and lowers sperm count. Too many studies to list have shown that people who get enough sleep live longer, healthier lives, but I understand that sometimes this isn't motivation enough. So consider this—not sleeping enough makes you fat. 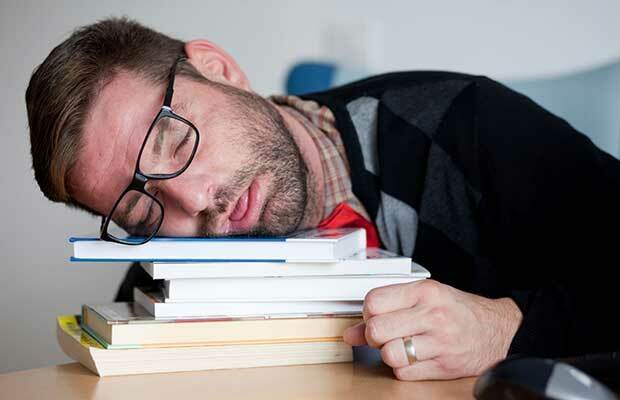 Sleep deprivation compromises your body's ability to metabolize carbohydrates and control food intake. When you sleep less, you eat more and have more difficulty burning the calories you consume. Sleep deprivation makes you hungrier by increasing the appetite-stimulating hormone ghrelin and makes it harder for you to get full by reducing levels of the satiety-inducing hormone leptin. People who sleep less than six hours a night are 30 percent more likely to become obese than those who sleep seven to nine hours a night. Most people need seven to nine hours of sleep a night to feel sufficiently rested. Few people are at their best with less than seven hours, and few require more than nine without an underlying health condition. And that’s a major problem, since more than half of Americans get less than the necessary seven hours of sleep each night, according to the National Sleep Foundation. A recent survey of Inc. 500 CEOs found that half of them are sleeping less than six hours a night. And the problem doesn't stop at the top. According to the Centers for Disease Control and Prevention, a third of U.S. workers get less than six hours of sleep each night, and sleep deprivation costs U.S. businesses more than $63 billion annually in lost productivity. Beyond the obvious sleep benefits of thinking clearly and staying healthy, the ability to manage your emotions and remain calm under pressure has a direct link to your performance. TalentSmart has conducted research with more than a million people, and we’ve found that 90 percent of top performers are high in emotional intelligence (EQ). These individuals are skilled at understanding and using emotions to their benefit, and good sleep hygiene is one of the greatest tools at their disposal. 1. Stay away from sleeping pills. 2. Stop drinking caffeine (at least after lunch). You can sleep more and vastly improve the quality of the sleep you get by reducing your caffeine intake. Caffeine is a powerful stimulant that interferes with sleep by increasing adrenaline production and blocking sleep-inducing chemicals in the brain. Caffeine has a six-hour half-life, which means it takes a full 24 hours to work its way out of your system. Have a cup of joe at 8 a.m., and you’ll still have 25 percent of the caffeine in your body at 8 p.m. Anything you drink after noon will still be near 50 percent strength at bedtime. Any caffeine in your bloodstream—the negative effects increasing with the dose—makes it harder to fall and stay asleep. 3. Avoid blue light at night. This is a big one—most people don't even realize it impacts their sleep. Short-wavelength blue light plays an important role in your mood, energy level and sleep quality. In the morning, sunlight contains high concentrations of this "blue" light. When your eyes are exposed to it directly (not through a window or while wearing sunglasses), the blue light halts production of the sleep-inducing hormone melatonin and makes you feel more alert. This is great, and exposure to a.m. sunlight can improve your mood and energy levels. If the sun isn't an option for you, try a blue light device . In the afternoon, the sun's rays lose their blue light, which allows your body to produce melatonin and start making you sleepy. By the evening, your brain does not expect any blue light exposure and is very sensitive to it. The problem this creates for sleep is that most of our favorite evening devices—laptops, tablets, TVs and mobile phones—emit short-wavelength blue light. And in the case of your laptop, tablet and phone, they do so brightly and right in your face. This exposure impairs melatonin production and interferes with your ability to fall asleep as well as with the quality of your sleep once you do nod off. Remember, the sleep cycle is a daylong process for your brain. When you confuse your brain by exposing it in the evening to what it thinks is a.m. sunlight, this derails the entire process with effects that linger long after you power down. The best thing you can do is avoid these devices after dinner (TV is OK for most people as long as they sit far enough away from the set). If you must use one of these devices in the evening, you can limit your exposure with a filter or protective eye wear. 4. Wake up at the same time every day. When you don't wake up at the same time every day, your brain doesn't know when to complete the sleep process and when it should prepare you to be awake. Long ago, sunlight ensured a consistent wake-up time. These days, an alarm is the only way most people can pull this off, and doing this successfully requires resisting the temptation to sleep in when you're feeling tired because you know you'll actually feel better by keeping your wake-up time intact. 5. No binge sleeping (in) on the weekend. 6. Learn how much sleep you really need. The amount of sleep you need is something that you can't control, and scientists are beginning to discover the genes that dictate it. The problem is, most people sleep much less than they really need and are under-performing because they think they're getting enough. Some discover this the hard way. Ariana Huffington was one of those frantic types who underslept and overworked, until she collapsed unexpectedly from exhaustion one afternoon. She credits her success and well-being since then to the changes she's made to her sleep habits. "I began getting 30 minutes more sleep a night, until gradually I got to seven to eight hours. The result has been transformational," Huffington says, adding that, "all the science now demonstrates unequivocally that when we get enough sleep, everything is better: our health; our mental capacity and clarity; our joy at life; and our ability to live life without reacting to every bad thing that happens." Huffington isn't the only one. Jeff Bezos, Warren Buffet, and Sheryl Sandberg have all touted the virtues of getting enough sleep. Even Bill Gates, an infamous night owl, has affirmed the benefits of figuring out how much sleep you really need: “I like to get seven hours of sleep a night because that’s what I need to stay sharp and creative and upbeat.” It's time to bite the bullet and start going to bed earlier until you find the magic number that enables you to perform at your best. When you work in the evening, it puts you into a stimulated, alert state when you should be winding down and relaxing in preparation for sleep. Recent surveys show that roughly 60 percent of people monitor their smartphones for work emails until they go to sleep. Staying off blue light-emitting devices (discussed above) after a certain time each evening is also a great way to avoid working so you can relax and prepare for sleep, but any type of work before bed should be avoided if you want quality sleep. Unfortunately for those with small children, the quality of your sleep does suffer when it is interrupted. The key here is to eliminate all the interruptions that are under your control. If you have loud neighbors, wear earplugs to bed. If your mother likes to call at all hours of the night, make certain you silence your ringer before you go to bed. If you had to wake up extra early in the morning, make sure your alarm clock is back on its regular time when you go to bed. Don't drink too much water in the evening to avoid a bathroom trip in the middle of the night. If your partner snores…. Well, you get the idea. If you think hard enough, there are lots of little things you can do to eliminate unnecessary interruptions to your sleep. Many people who learn to meditate report that it improves the quality of their sleep and that they can get the rest they need even if they aren't able to significantly increase the number of hours they sleep. At the Stanford Medical Center, insomniacs participated in a six-week mindfulness meditation and cognitive-behavioral therapy course. At the end of the study, participants' average time to fall asleep was cut in half (from 40 to 20 minutes), and 60 percent of subjects no longer qualified as insomniacs. The subjects retained these gains upon follow-up a full year later. A similar study at the University of Massachusetts Medical School found that 91 percent of participants either reduced the amount of medication they needed to sleep or stopped taking medication entirely after a mindfulness and sleep therapy course. Give mindfulness a try. At minimum, you'll fall asleep faster, as it will teach you how to relax and quiet your mind once you hit the pillow. 10. When all else fails, take naps. One of the biggest peaks in melatonin production happens during the 1 to 3 p.m. time frame, which explains why most people feel sleepy in the afternoon. Companies like Google and Zappos are capitalizing on this need by giving employees the opportunity to take short afternoon naps. If you aren't getting enough sleep at night, you're likely going to feel an overwhelming desire to sleep in the afternoon. When this happens, you're better off taking a short nap (even as short as 15 minutes) than resorting to caffeine to keep you awake. A short nap will give you the rest you need to get through the rest of the afternoon, and you'll sleep much better in the evening than if you drink caffeine or take a long afternoon nap.